Heraldry: Heraldry in the Movies! Facebook poster, fellow blogger, and heraldry enthusiast (among several other things) Father Guy Sylvester pointed out that, in light of the new Iron Man 3 movie opening next weekend, discussions will start up again about what the coolest thing about Tony Stark (played by Robert Downey, Jr.). Father Guy notes that the first Iron Man movie has already revealed "THE. coolest. thing. ever. 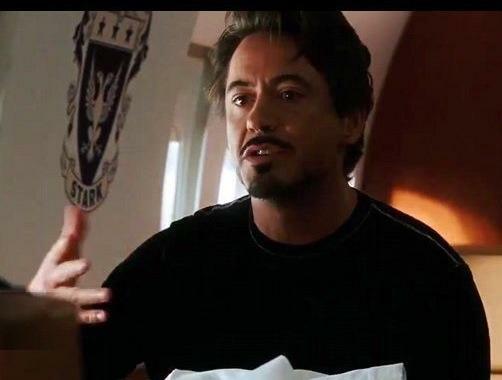 In the scene showing Tony in his private jet we see on the wall behind him that TONY STARK HAS A COAT OF ARMS!!!" I'd blazon it as Azure a double-headed eagle displayed and on a chief Argent three mullets Azure. Unfortunately, it appears to follow a common "bucket shop" motif of placing the surname on what should be the motto scroll beneath the shield. Indeed, a link to Father Guy's new blog Exarandorum can be found under the header "Other Blogs of Heraldic Interest" in the left-hand column here.